Nurture the budding classical-music fan in your life with this nine-CD box set of much-loved classical pieces. Enter for a chance to own the "My First Classical Albums" box set. 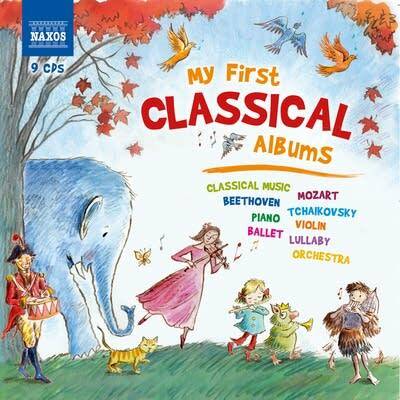 The "My First" album series from Naxos Records makes a good springboard for a lifelong journey through classical music. Each selection is carefully tailored for younger listeners, and includes famous tracks as well as unexpected gems: Vivaldi's The Four Seasons; Tchaikovsky's Swan Lake; Joplin's Maple Leaf Rag; Offenbach's Can-Can'; Mozart's Magic Flute; and John Williams' score to Harry Potter are all included in this set that comprises more than 11 hours of music. The accompanying booklet is full of information on every piece of music. Unique, imaginative and colorful, these CDs will open a door to a wonderful world that children and parents can discover together. Enter for a chance to win a copy of My First Classical Albums. Winners will be drawn at random. Be sure to enter by 11:59 a.m. CST on Tuesday, Jan. 3, 2017. Subscribe me to the YourClassical newsletter.